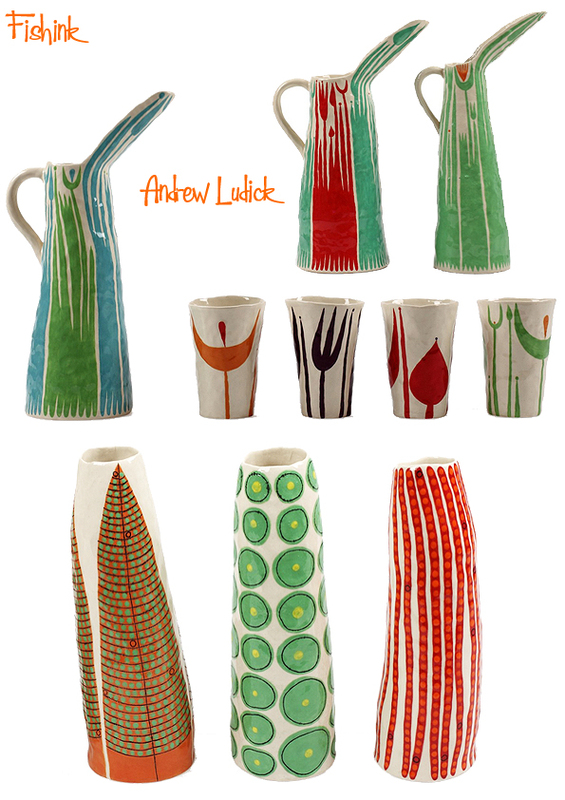 I’ve spoken before about the wonderful ceramics by Andrew Ludick and I know his work delights you too as the post I created is constantly searched for. 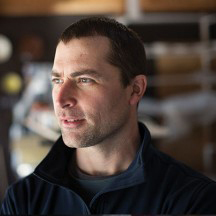 One of my readers recently asked a question about Andrew’s ceramic techniques and that prompted me to get in touch with him and bring us all up to date with his work. 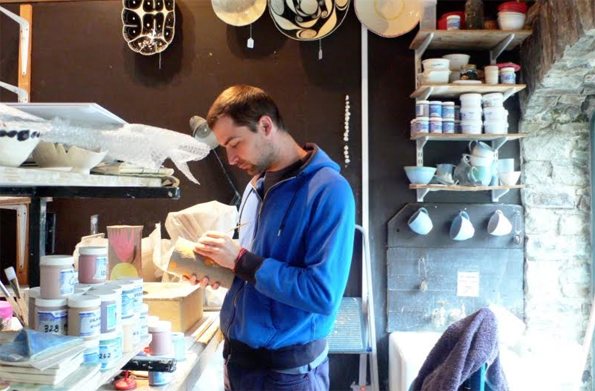 How long have you been making ceramics now and did you do something else artistic prior to this ? I have been making ceramics for about 12 years. Before that I did painting and drawing mostly, selling work through galleries and trying to make a living that way, I still do lots of drawing in sketchbooks and some painting but mostly as preliminary design work for ceramics. 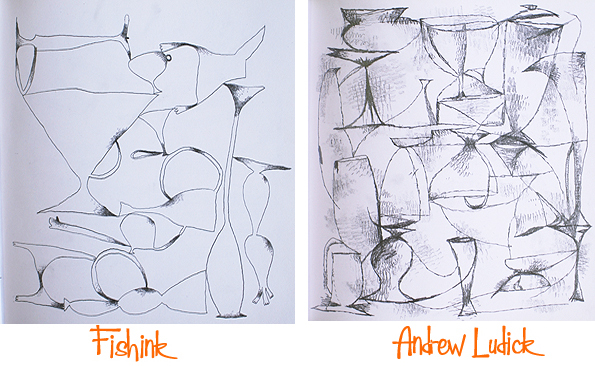 Here’s some of Andrew’s sketchbook drawings he kindly photographed for us. 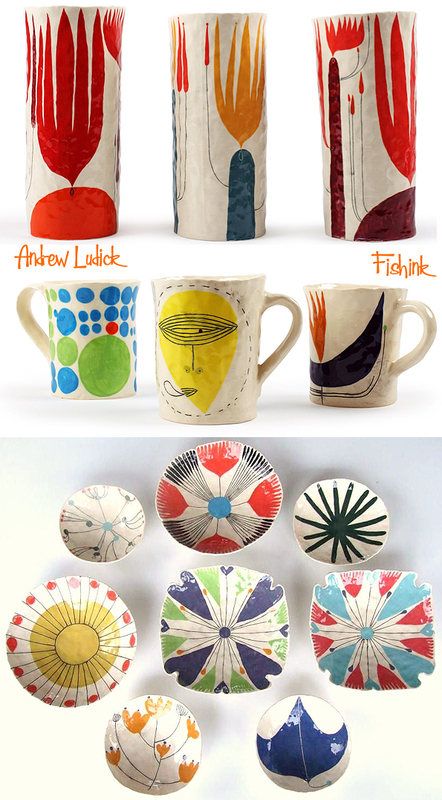 What first inspired you to start making ceramics for yourself ? 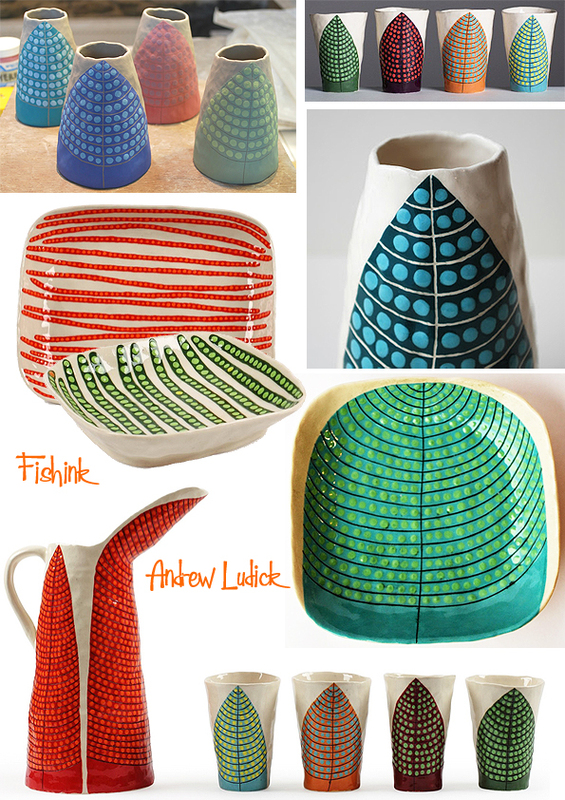 I think I was inspired by ceramic work made by some of the more poplular painters, like Picasso, Miro, and Gaugaun. I thought it was really interesting how it could be viewed as another medium for painting, much like printmaking is. Also work by South American people of Peru and many works by African artists. I see you are interested in the work of other painters (Paul Klee), are you inspired by any other ceramists and if so, who ? 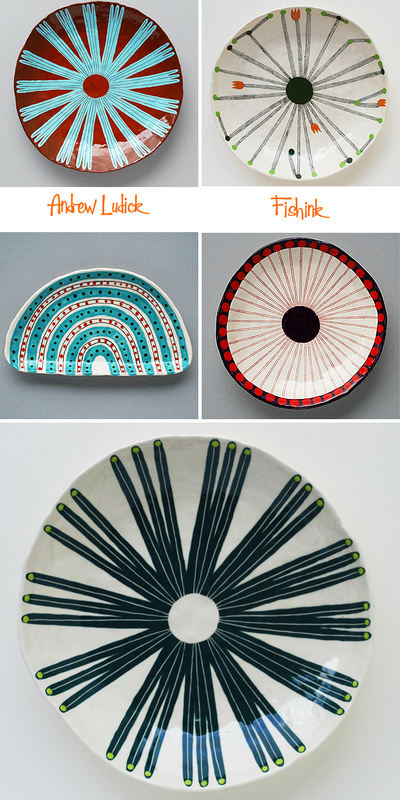 One of my big influences is the Irish Ceramicist John Ffrench. 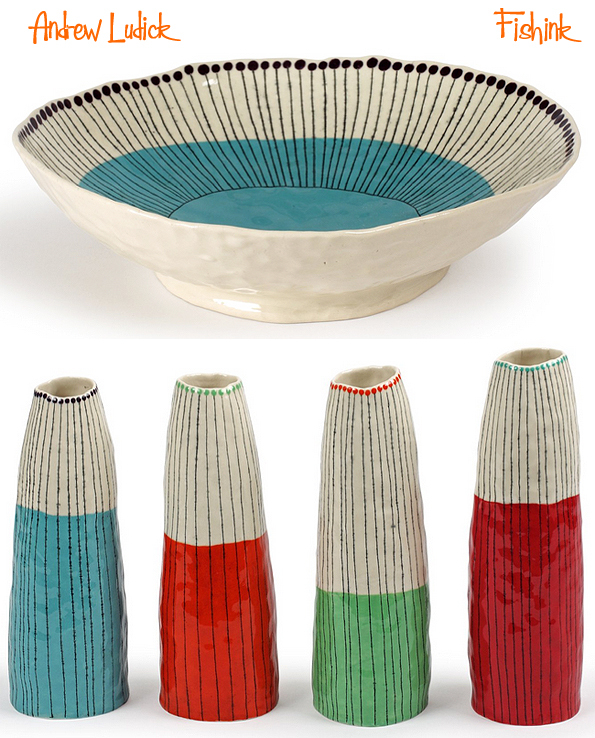 His style is very individual, he was influenced a lot by ceramics from India as well as modern ceramics from Italy. He really stood out among Irish pottery throughout history at a time when many people were being influenced by English, and Asian pottery styles, he was making work very differently and being influenced by ceramics from around the Mediterranean as well as India and Italy. He really stayed true to himself and I imagine that was a hard thing to do when everyone else was moving in the Bernard Leech direction. A really great book was just published on him and I highly recommend it. It is titled The Life and Work of John Ffrench: Irish Ceramic Artist. At times your work reminds me a little of papier mache. What made you decide to hand build your pots and plates rather than use the potters wheel ? I like the pace of hand-building, its much slower than throwing and I feel like I have more time to think and interact with whats happening with the piece as I create it. I think the pace of hand-building also matches that of drawing and painting, I have time to stop and make decisions, get up, walk around and stare for a while or even cover it in plastic and come back to it a week later and see it with new eyes. I also can do that while I’m decorating the piece. Sometimes I can make a form and wrap it in plastic and come back to it a month or more later when I’ve finally figured out how to decorate it. Here’s a short video of Andrew making a bowl. I love the splashes of bold colour and spidery black lines that you use. Do you sketch ideas for your work beforehand or does the shape or decoration process determine what the finished piece will become ? I think both of these things happen. Sometimes I will create a decoration or pattern or something while I’m working in my sketchbook and then try and create a form that matches up or compliments it somehow. Sometimes I will make a form and have no idea what I’m going to paint or draw on it, so I make some sketches with that in mind or I look at some old sketchbooks to see if anything I’ve already created might work. Recently I’ve started drawing ideas onto the leather hard clay very lightly with a pencil just to give me an idea if something would work. If I find a decoration or something that really works with a form then I will reproduce that piece a few times but just change it slightly each time. So sometimes the first form and design can look quite different from one made later on. 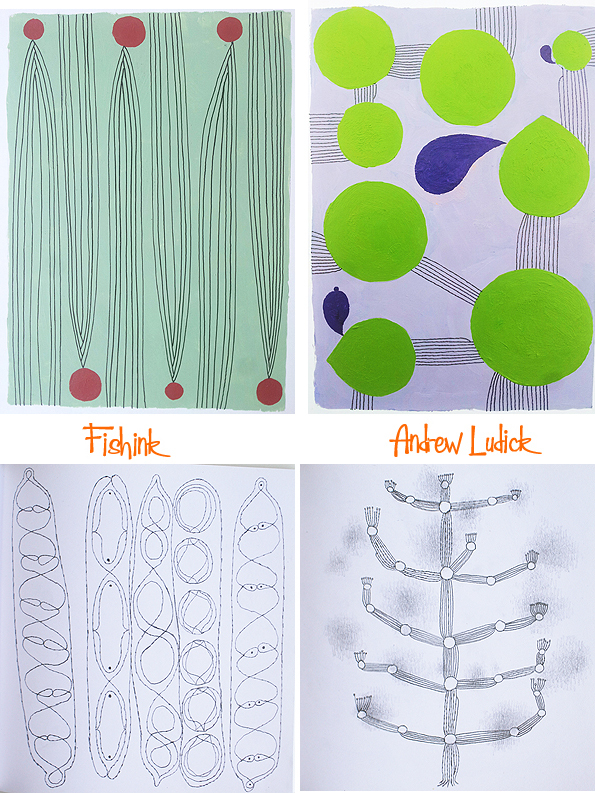 It’s really nice to see work evolve like that in a natural linear progression. 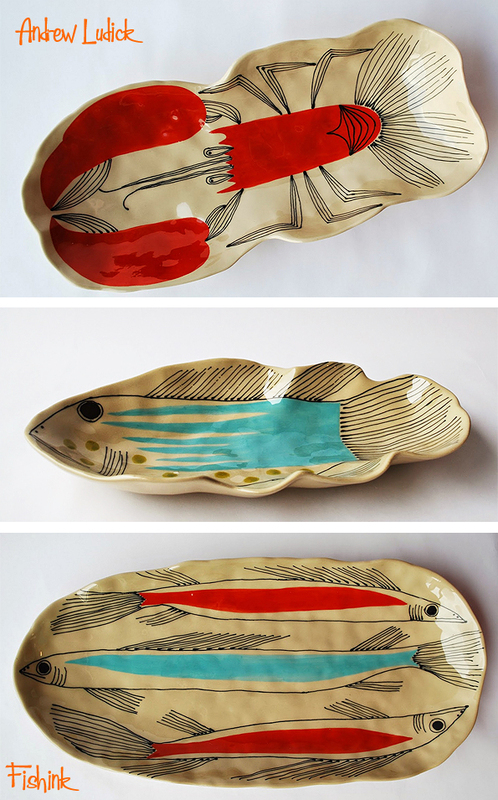 Where did the inspiration for the Fish plates come from ? I think I had made a few round bowls that had sea urchins, star fish and other things in them. Then one of them I made a flounder like fish in. At the time I was also making these long bean dishes so I took that shape and fit the fish into it. After making it a few times I started to make the shape more fish like and let the fins and tails become more pronounced. What plans do you have for your work going forward, new shapes, places to exhibit and display your work in ? I sort of have a backlog of shapes and designs that I want to work on, they are all sitting and waiting in my sketchbooks to be created. I started working in a red earthenware which is a nice change. The clay that I use at the moment is white earthenware so it is very versatile in what colours work on it and the black line drawings show up beautifully like on paper. With the red it has its limitations, which I like, as to what colours you can use, and it is very nice to work with in hand-building. I am also starting to work larger and larger. Pieces that I had made in the past in smaller sizes I am remaking in much larger sizes which give them a bigger presence. 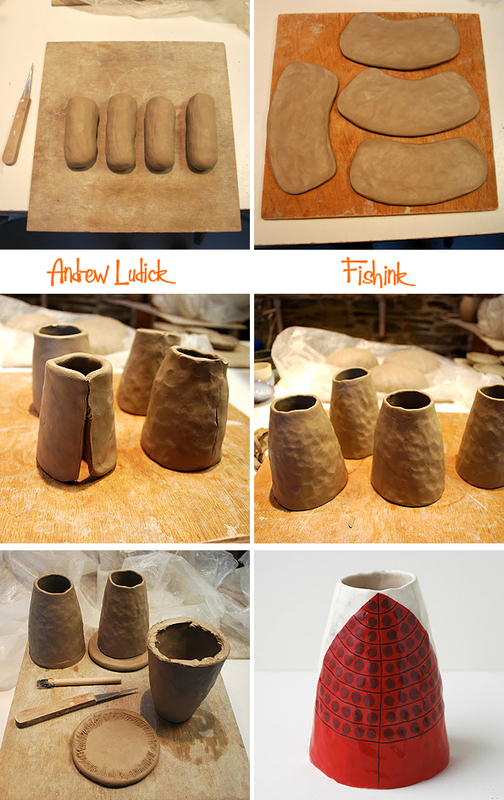 Here’s how Andrew builds up some of his pot shapes. The decoration and shape of the ceramic share equal importance to the look of the finished piece. Many thanks Andrew for answering my questions today, it’s been great having you back on Fishinkblog. You can see more of his work or contact him to purchase something here. yeah, love the bowls. thanks for including that short video.